Blue fescue grass (Festuca glauca) is a colorful ornamental grass with icy blue foliage and pale yellow flowers. It is drought-tolerant and grows in USDA plant hardiness zones 4 through 8. Gardeners like its ease of care and its fine texture, which makes it a good companion plant for heavier or more dramatic plantings. Unlike some other plants grown as ornamental grasses, F. glauca is a true perennial grass, a member of the Poaceae family. It is different, however, from the tall fescues typically used in turf lawn mixtures. Plant blue fescue in full sun and in well-drained soil, although it will tolerate poor soils. The more sun this ornamental grass receives, the more likely it is to achieve its famous blue-gray color. Space clumps fairly close, about 8 to 10 inches apart since the plants don't spread very much. In cold climates, blue fescue grass often turns brown in winter, but many growers leave it standing to help protect the roots from cold. Cut back the foliage in early spring to within a few inches of the ground. This will help make room for the new grass blades and will improve the look of the plant. Gardeners in warm climates may experience a different problem with blue fescue. Above-ground growth may die back during the summer, due to excessive heat and humidity. When this happens, give the plant a "haircut," since its appearance is temporarily spoiled anyway. In many cases, the plant will recover when more moderate weather returns. Mulching with a 3-inch layer of bark mulch or other organic material is advisable, especially when fostering the growth of young plants. Mulch helps to conserve moisture in the soil and suppress weed growth. It eventually decomposes and releases nutrients into the soil (at which time you can replace the old mulch with a new batch). To keep foliage looking good, remove dead blades of grass, and remove the flower heads to encourage a dense, mounded shape. Leaving the flowers may cause the plant to self-seed; this can be fine where you want the plant to spread, but will require culling out the volunteers if you want to keep it confined. There are few pest and disease problems with blue fescue, but the plant will die within a few years if it is not lifted and divided. 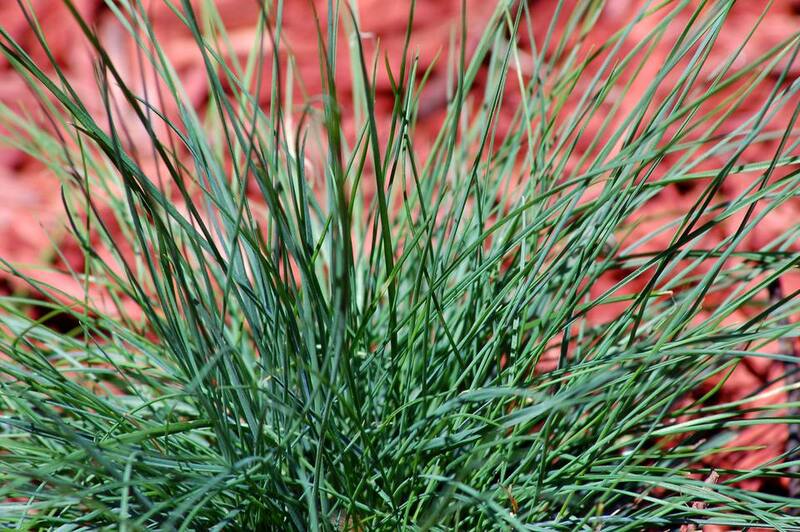 Blue fescue thrives on full sunlight; it tolerates shade, but will not flower as well. This plant prefers relatively dry soil that is well-drained. It does not tolerate wet, soggy conditions. This plant has average moisture needs. Water weekly during hot summer months to keep it green and growing; short periods of drought will stunt, but not kill the plant. Blue fescue prefers cool summers but does fine in moderately warm conditions, but blistering heat and high humidity will cause the foliage to die back and may shorten the lifespan of this already short-lived perennial. Compost applied around the plant as a mulch provides all the feeding that blue fescue requires. Within a few years, blue fescue will begin to develop brown areas in the center of the clump, and will soon die away altogether unless lifted and divided. This plant rarely lives past three to five years unless it is divided. Pry the dying plant up out of the ground with a shovel or garden trowel. Cut the clump in half, prying away the brown center portion of each smaller clump. Replant the two new clumps as new plants, spacing them 8 to 10 inches apart. Festuca glauca 'Elijah Blue' is the most popular cultivar, an 8-inch tall plant with light blue foliage. F. glauca 'Golden Toupee' has leaves that are chartreuse instead of blue-green. F. glauca 'Blaufink' is a compact cultivar (6 to 8 inches tall) with a finer texture. F. glauca 'Tom Thumb' grows to be only about 4 inches tall. F. glauca 'Harz' has blades of an olive-green color, with a hint of purple at times. A very similar plant to blue fescue is tufted fescue (Fescue amethystina), sometimes called tall blue fescue. It has very similar growing habits and is planted and cared for in much the same way as blue fescue. But tufted fescue is a taller plant, and a number of cultivars have attractive olive-green foliage.